Without a doubt, one event in the history of Native Americans overshadows all others in its impact on their culture - the discovery of the Western Hemisphere by European explorers. This catastrophic event is the main focus of The First Americans, which traces the tumultuous relationship between Native Americans and Western settlers. However, the book also reveals the true story of Aboriginal concepts and history, showing how tribal cultures worked and how their spirituality developed, rather than exclusively focusing on their conflict with settlers. 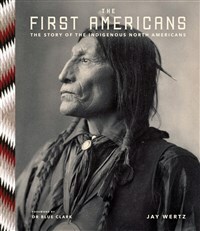 Wertz explains the relationship between Native Americans and their cultural roots in the modern world, tracing their history into the contemporary era. It is illustrated throughout with artworks, maps and photographs as well as painstakingly researched documents from US archives and private collections. Jay Wertz is the author of The Civil War Experience (Carlton) and a columnist for the Civil War Times. During his research for this book he spoke to notable Native Americans, such as Adam Fortunate Eagle, Johnny Bear Contreras, Waneek Horn-Milller and America Meredith. Dr. Blue Clark is a Native American of Muscogee/Creek origin. He is an expert in Native American studies and currently holds the David Pendleton Chair of American Indian Studies at Oklahoma City University.